If you’ve read this blog for awhile, you’ll know I have an older sister who works at Neiman Marcus in Austin. She’s amazing at her job and is always sending me pics of the latest new-season arrivals, marked-down merchandise, and pulling things she thinks I’ll love before I get to the store. This coral 10 Crosby by Derek Lam sweater is one of those items! 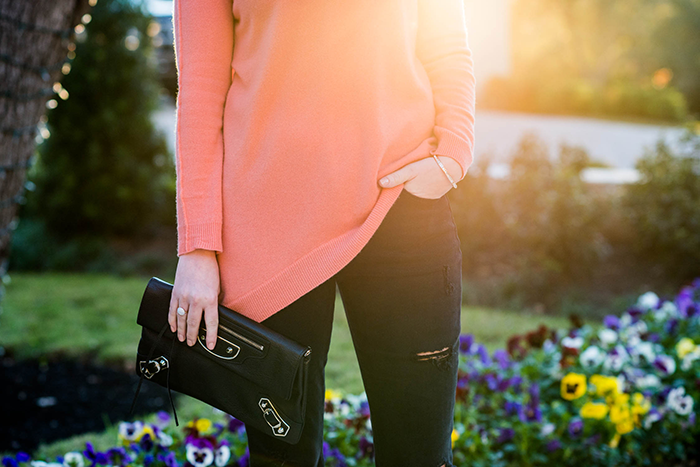 It comes from an exclusive collaboration the designer did with CUSP – I fell in love with the punchy shade of peach and asymmetrical hem of this knit. It’s going to be a perfect transitional piece for spring, when the weather is still cold but I want to wear softer colors! 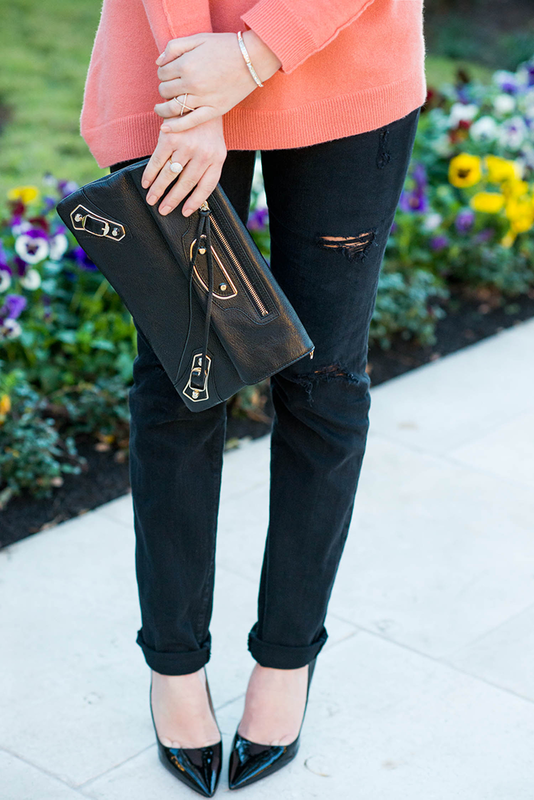 While I’m wearing my favorite Current/Elliott boyfriend jeans in this post, I did want to mention another pair of jeans that my sister also helped me find. I don’t want to assume that you’ve noticed, but over the last couple of months I’ve really made an effort to improve my diet. The change in my diet coupled with the exercise I’ve already been doing has helped me lose over 10 lbs since November! When I got back to Austin for Christmas, I realized the black skinny jeans I brought with me no longer fit – they were too big and kept getting baggy! Imagine my excitement! I texted my sister and told her I needed a new pair of high-waisted skinnies, and she brought me a pair of these. The only phrase I can use to describe this pair of miraculous denim is O.M.G. They are incredible! They are the perfect high-rise fit, and skinny all the way to the ankle. I may have to buy another pair since I wear them practically every day. Shop them here and here. Outfits featuring these jeans to come soon! These jeans do look awesome and great clutch too. Also I LOVE all of those pansies… pansies are the perfect little winter flower! Love the cut and shade of that sweater, so pretty! I am not only loving that stunning outfit on you, but that sunlight. Enjoy your beautiful weather! Congrats on loosing 10lbs! You look beautiful! Congratulations on the weight loss! The coral looks great on you! Adore that sweater! You look gorgeous! You look great!! That coral color is gorgeous on you and perfect for all seasons! Love this look! So cool about your sister. I love sharing a love of fashion with my sister. Those ripped black jeans are so great. I need a sister who works at Neimans! This color is amazing on you! Everything about this look is just perfect! I love the heels and the jeans are amazing too! This is hands down on of my favorite looks on you. 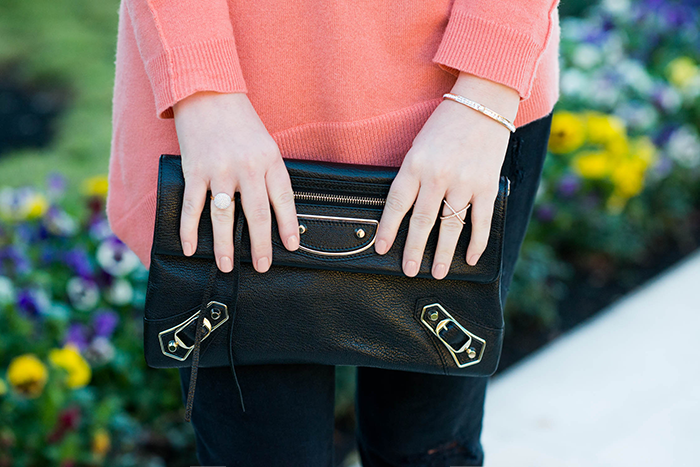 Love the coral and black. You look awesome! Great outfit! I love that Balenciaga clutch! You have such a lovely blog. Such a cute outfit and we are loving the back-lit photos!